Yes, it's the first day of Fall. Autumn. The weather has been beautiful lately and I was pleased this past Saturday to know that three of my brides (one of which was having an outdoor wedding) would be enjoying beautiful, beautiful days. This coming weekend I have three more brides getting married. Whew! No wonder the summer flew by. Saturday is not only a wedding day but it's also the day New Bremen holds its annual Pumpkinfest. Kat and I will have a booth. I know she's been working hard to have some cute items for sale and I intend to do the same. I decided to get on the ball and post a couple more Bride Photos. 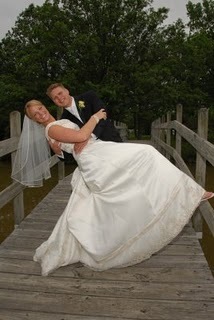 This is Kimberly Hausfeld and Zachary Wiford, formerly of Minster, currently of Dublin. It's sort of rare that I met the groom, so I've never met Zach. But I got to know Kim (and her nice mother Elaine) very well and I can tell this picture is reflective of a fun, and fun loving couple. Their bridesmaids were decked in a colorful green for the June wedding. I know they had a fabulous time. Awhile back I purchased an etiquette book at the Canalside Bookstore in St. Marys. I wanted a book that would be a reference for the sort of things that don’t go out of style. The book I purchased was admitably outdated but I thought it would make interesting reading material. “Amy Vanderbilts Complete Book of Etiquette” was published in 1952 and still holds correct information for addressing wedding invitations. However, later in the book proper Ms. Amy devoted 68 pages to the proper ways a woman should present herself (in 1952) to the world. I didn’t read them all but here are some highlights. I thought it would be fun to post them from time to time. I won’t even tackle the two pages devoted to the proper way a woman should sit. But I can assure you, I'm definately doing it wrong. -The Chestnuts, Oaks, and Maples, And leaves of every name. Miss Weather led the dancing, Professor Wind the band.